The Winning Formula. Our Research + Our Buying Skills = Your Results. Our regular readers would remember that 2015 was a very big year for our motivated Western Australia based clients Jason and Jamie. After first contacting PROPERTYOLOGY in April 2015, Jason and Jamie realised they needed help to fully maximise their capacity and truly diversify their property portfolio (which consisted of two properties, both located within minutes of where they lived, because ‘they knew the area’). Throughout the second half of 2015, they worked closely with our Property Investment Advisors to create a formal Property Investment Strategy which then gave them the ability and confidence to work with our Market Research Team and Buyer’s Agents to purchase three investment properties. Jason and Jamie have kicked off 2016 right where they left off. After approaching and working closely with our finance team again, Jason and Jamie were able to arrange for finance to assist in executing the next stage of their investment strategy. 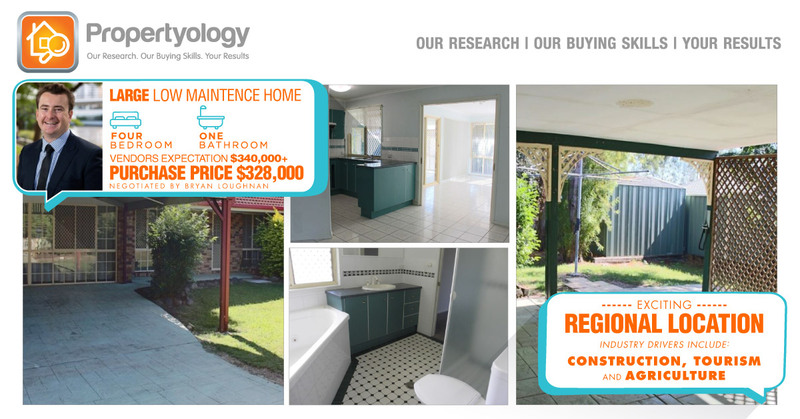 At PROPERTYOLOGY we get a real buzz out of working with motivated people who treat investing with a high degree of importance. The location of this most recent property which we have assisted Jason and Jamie secure, is PROPERTYOLOGY’S best kept secret. This regional location will soon be home to one of Australia’s biggest industrial parks. It will be home to some of the biggest warehousing and manufacturing companies in the country. Thousands of new long-term jobs will result in a significant increase in demand for additional accommodation. That’s what we call ‘real research‘. This well presented, low maintenance, structurally sound, 4-bedroom house is situated on a large 804m2 block. It has an open plan living, dining and kitchen area as well as an additional living/rumpus room which could actually be utilised as a 5th bedroom is so desired. All of this for ONLY $328,000! As an additional cherry on top, the property has recently been tenanted at $350pw – a rental yield of over 5.5%. Congratulations on taking yet another step to becoming financially independent Jason and Jamie! Do You Believe Regional Towns Are Taboo For Property Investing?